The terms “goals” and “objectives” are often used interchangeably when discussing learning outcomes. Although they do have similarities, they are different at their core. Learning goals and learning objectives are similar in that they both describe the intended purpose and expected results of teaching activities. They describe what the learner will get out of attending the session. Goals and objectives are both used to design the learning course. The course goal is first established then the objectives are derived from that course goal. Establishing the goals and objectives helps to provide direction for the course instruction and activities. Lastly, they both are similar in that they create the foundation for assessment. 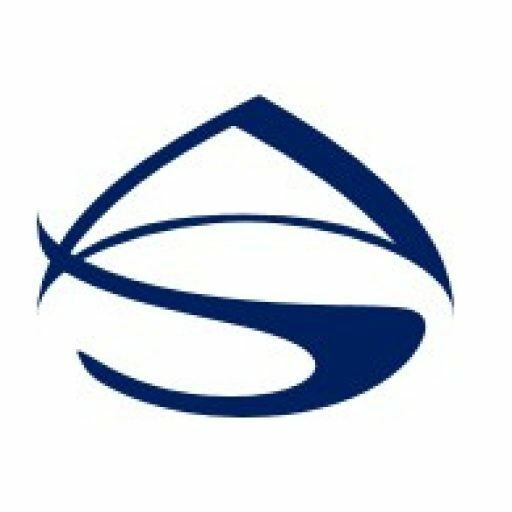 By creating goals and objectives, we are able to develop assessments to determine the level of knowledge gained by the participants through course instruction and activities. The main characteristic that distinguishes goals from objectives is the level of specificity. Goals define the overall purpose of the learning in broad, general terms and do not provide specific guidance on how to achieve that purpose. Goals just describe what the participant will gain from the overall learning event in a general sense. Learning objectives are much more specific than goals. Objectives are expressed in explicit terms of what the participant will be able to do by the completion of the course. They are the individual steps to achieve the learning goal. Goals are the long-term end results. They describe what the participant will achieve by the end of the course. They are intended to help focus on the long-range big picture. Objectives are established from the learning goal. They describe what an instructor will cover in a course to meet the goal. They describe the short-term tasks that the participants will be able to do. The goal can be thought of as the destination, and the objectives are the stops you make along the way to that destination. When designing a course, objectives are derived from the course goal. Having the participants accomplish the objectives will lead to the reaching the goal. Essentially, objectives are benchmarks by which to measure progress towards the achievement of the larger goal. 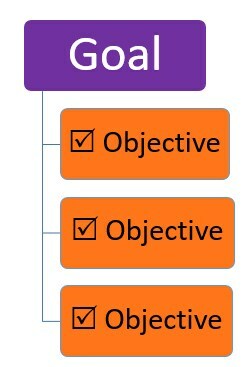 Typically, there are several objectives tied to a single goal. All objectives should be observable and measurable, whereas goals are often broad statements that are often hard to observe or measure. For example, a goal may be to “understand” or “increase awareness” of something, both of which are hard to discern or gauge another person competency level. 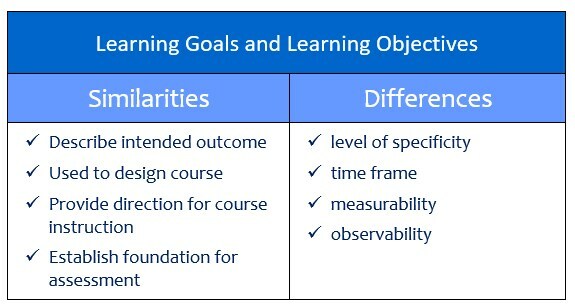 Learning objectives are observable and measurable outcomes that describe what the learner will be able to do as a result of the learning activity. Objectives should be written using observable action verbs. Increase awareness of the importance of maintaining a healthy lifestyle.